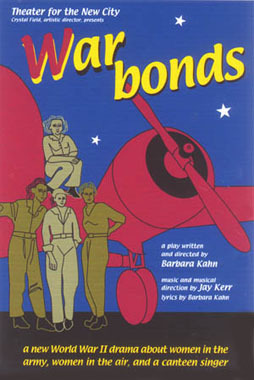 women in the air and a canteen singer"
War Bonds was inspired by the long-neglected stories of women in the military during World War II, especially women pilots and army recruits, and the problems faced by lesbians among them. 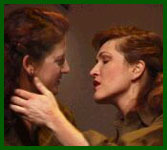 It is a love story that shows how two women, scarred by their wartime experiences, find a new life with each other after the war. 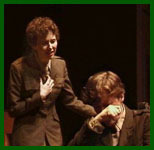 In researching an earlier play about World War II, I found stories that I felt could support a separate full-length play. How did lesbians meet and identify themselves to each other? What were the risks in doing this? I read first person accounts of lesbians who were the subject of "witch hunts." I interviewed veteran pilots from the Women's Air Force Service Pilots (WASPS). 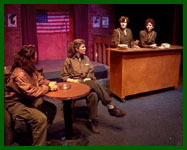 They told me about the class conflicts between the women in the army and the women who flew. They discussed all the kinds of planes they had flown. At the WWII Weekend at the Air Museum in Reading, Pennsylvania, where I conducted the interviews, I had a chance to look at and photograph restored planes. There were also displays of typical encampments, as well as an Army canteen, complete with performers. 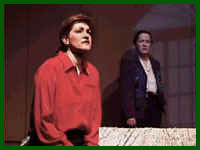 The canteen setting was so exciting and popular that I decided to incorporate that into my play. For the songs, I contacted Jay Kerr, a composer with whom I had previously collaborated. Together we have written nine "new World War II songs" that are performed by the canteen singer in War Bonds. 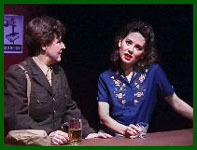 Because I am a lesbian playwright who is fortunate enough to have a venue for my plays in New York City, I have decided to write plays about lesbians. Because of my penchant for history, I have been able to know the joy of discovering our past and have the honor of recreating it for the stage. The premiere production was made possible, in part, by grants from the Arch and Bruce Brown Foundation and the Jerome Foundation.